Photographed on the Saturday 01 August 2015. The Common Wasp (Vespula vulgaris) is a social wasp that can form nests as small as a dozen or so in the roof of your shed to colonies boasting 10 000+ in burrows or other suitable nesting sites. The nests are built of a paper like material scavenged from dead and dying wood which they mix with saliva to form a pulp which is then applied thinly to create the paper texture, from which amazing architectural nests are built. Contrary to popular belief wasps do not eat insects and spiders as they are actually vegetarian and as such important pollinators. However, there larvae do eat the arthropods that the wasp catches for them and are masticated before being fed to the young (grubs/larvae). Vespula Vulgaris belongs to the Class Insecta, Order Hymenoptera (wasps, bees & ants), Suborder Apocrita, Family Vespidae and Genus Vespula. 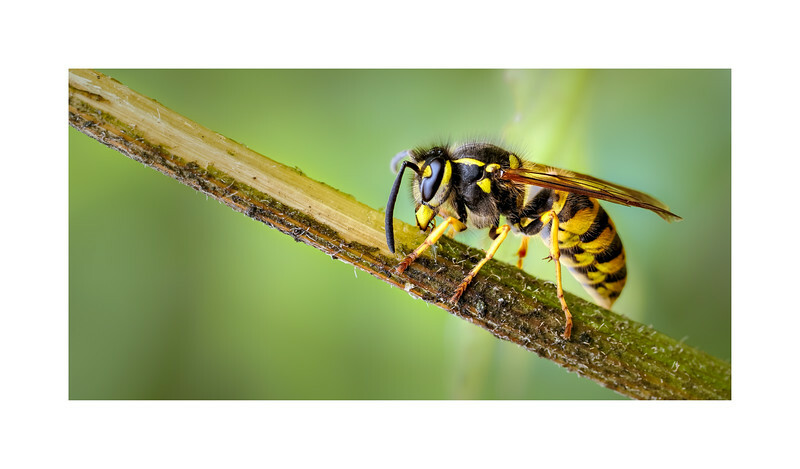 There are approximately 9 000 wasp species in the UK, 250 of which are the larger wasps equipped with a stinger of which only 9 are social wasps that form large nests, the majority are solitary wasps and are harmless to us. The glaring black & yellow stripes serve as a warning to other animals that they are dangerous and many other species including spiders mimic this warning for protection against predation. The nest building and growth of the colony goes through a series of stages (see links) before the last emergence of males and queens which mate, where the male then dies and the female seeks a sheltered spot to overwinter. It is during the growth of the colony that the smaller works are busy looking for protein (other insects etc.) and sugars to for the young and their own energy supplies (sugar), hence their attraction to sugary drinks etc., etc.